ScanFlow™ is a comprehensive and powerful software solution for the optimization of your production workflow in the field of mass digitization. It pulls the strings in the background like a puppeteer and manages all the different tasks from scanning, post processing to completion of the scan jobs. The operators only see the visual part of the whole digitizing steps. Therefore mistakes are reduced to a minimum and effectiveness is increased. 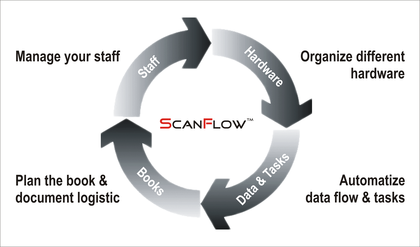 ScanFlow™ Professional helps to organize and to coordinate all resources in an efficient way. By this it increases the output quality on the one hand side and reduces the personnel costs on the other hand side. For the head of the digitizing centre it offers monitoring and reporting functions for a better overview of the projects. ScanFlowTM allows to create and customize multiple workflows. These can be executed simultaneously. ScanFlowTM provides an undo functionality. You can return to any previous task, adjust settings and execute the task again. ScanFlowTM provides previews for all implemented post-processing functions. ScanFlowTM executes all post processing functions on an image copy, so that the original image still remains unchanged. ScanFlowTM allows to schedule all tasks to guarantee an optimal resource management (e.g. time consuming and computationally intensive tasks shall be processed over night). ScanFlowTM allows to execute external scripts automatically by using a CLI (Command Line Interface). ScanFlowTM supports automatic import functions. ScanFlowTM enables the automation of FTP-uploads. ScanFlowTM reports automatically if every task has been executed and generates status reports of all embedded workflow tasks. ScanFlowTM enables users to communicate within the software by using inter-task messages. ScanFlowTM supports a monitoring of all processes by remote access via web interface.